I've just installed eosfactory and a fresh copy of EOS on my WSL ubuntu 18.04 and I'm failing all of the initial unit tests indicating there might be a problem with my install. Any ideas on how I can fix this awesome testing tool? This looks like a consequence of the incompatibility between EOSIO v.1.1.x and EOSFactory v1.1. EOSFactory v1.1 is compatible only with EOSIO v1.0.8 and v1.0.9, not higher (the assumptions made in the release notes turned out to be over-optimistic). Not the answer you're looking for? Browse other questions tagged nodeos testnet unit-tests or ask your own question. How can I run a single node testnet with no internet connection? 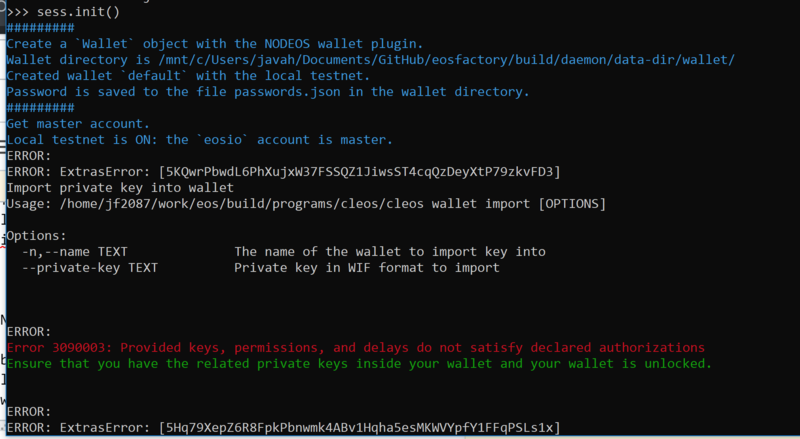 How to run EOS nodeos in Testnet? Account creation on jungle testnet node?